The Selway River flows through Idaho's Selway-Bitterroot Wilderness and is considered a premier wilderness whitewater float trip. The free-flowing river has a short season and very limited launches. The Lower Selway has easy/intermediate white water, unique rainforest ecosystem and a rich cultural history. ROW offers whitewater rafting trips on the last twenty miles of the Selway River, from Selway Falls to the river's confluence with the Lochsa River. This section of the Selway is a perfect family rafting trip and is ideal for beginners since it requires no previous whitewater rafting experience. "The Selway, which meets the Lochsa near the hamlet of Lowell, is a different character. Where the Lochsa is stirred and frenzied, the Selway is more meditative, deeper, moving at a much gentler pace for the most part. It is another one of the places here that reminds me of Alaska, mainly because of the wildlife. While hiking and fishing the Selway, I've seen moose, elk, black bears, every manner of raptor, and have come upon tracks of cougars, the most elusive of Rocky Mountain inhabitants." The Selway River is protected by the U.S. Congress under the Wild and Scenic Rivers Act and is one of Idaho's most pristine rivers. This piece of Idaho is unique because it includes a temperate rainforest. Some of the plants found here are also found on Washington's Olympic Peninsula, but nowhere else. ROW's Lower Selway rafting trips float you through a scenic masterpiece. Just one launch per day is permitted and a Selway raft trip carries you through a thick forest of cedar, fir and larch. The Selway's banks are overgrown with emerald ferns, spongy mosses, huckleberries and mountain spray. You'll likely see osprey, bald eagles and waterfowl as you paddle, maybe even a playful river otter. ROW's professional interpretive river guides will teach you about the Nez Perce Tribe, the original inhabitants of this majestic land. The Selway River provided rich fishing waters and you can still see salmon jumping at Selway falls early in the summer. ROW also outfits fly fishing trips on the Lower Selway. You have the choice of riding in a raft or paddling your own sit-on-top kayak or inflatable kayak. Your rafting or kayaking adventure on the Selway begins and ends at River Dance Lodge, Idaho's Outdoor Adventure Resort. Situated along the banks of the Clearwater River and surrounded by Rocky Mountain scenery, River Dance Lodge is the perfect all-inclusive vacation resort. 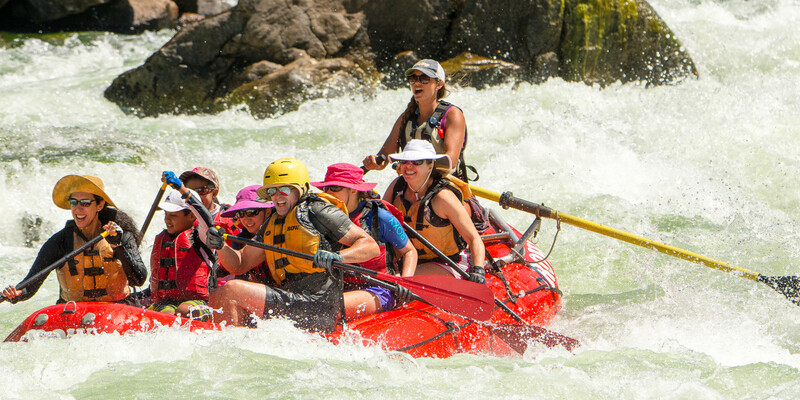 Package pricing is available if you'd like to relax before or after your Selway rafting trip. ROW is proud to be an Equal Opportunity recreation service provider under permit from the U.S. Forest Service. We operate under special use permit from the Clearwater National Forest. All our operations and facilities are operated on a non-discriminatory basis. ROW is bonded and fully licensed by the states of Idaho, Washington, and Oregon. We are members of America Outdoors, Idaho Outfitters and Guides Assn., Montana Outfitters and Guides Assn., National Association of Interpretation; Lewis and Clark Trail Heritage Foundation and many other effective organizations.